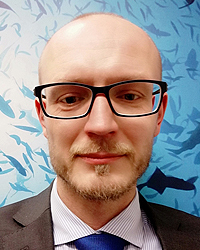 Pawel Swiderek is the deputy head of the IUU Fisheries Policy unit within the Maritime Affairs and Fisheries Directorate General (MARE) of the European Commission. This unit develops and implements the EU’s policy to prevent, deter and eliminate Illegal, Unreported and Unregulated (IUU) fishing and works towards closing the loopholes in international fisheries which allow operators to profit from IUU fishing. Before taking up his current position, Mr Swiderek was Policy Officer responsible for international trade in Maritime Affairs and Fisheries Directorate General and Policy Officer responsible for preferential rules of origin in the Directorate-General for Taxation and Customs Union.